Today I took a saw and sliced a section off of my HHSI Student Trinity harp. 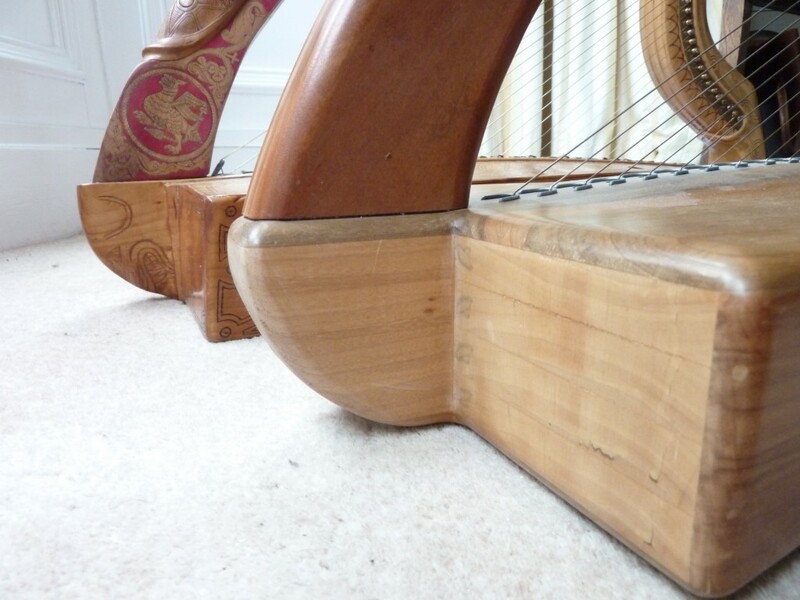 I have been dissatisfied with the squared-off foot of the HHSI Student medieval Irish harps, and also with the HHSI Connemara instruments, as well as with many Trinity and Queen Mary-style instruments. Some time back I realised that the curving foot of the Queen Mary harp has a practical function, as detailed on this site. I pointed out then that although the foot of the Trinity harp is now missing, the relative damage to each bottom corner of the soundbox is consistent with a similar shaped foot and playing position for that harp as well. So, now that my own 2005 HHSI Student Trinity harp is here at my house, and I am playing it regularly to evaluate its new stringing and tuning regime, I decided I had to act; I took the saw, and sliced the rear corner of the foot off. 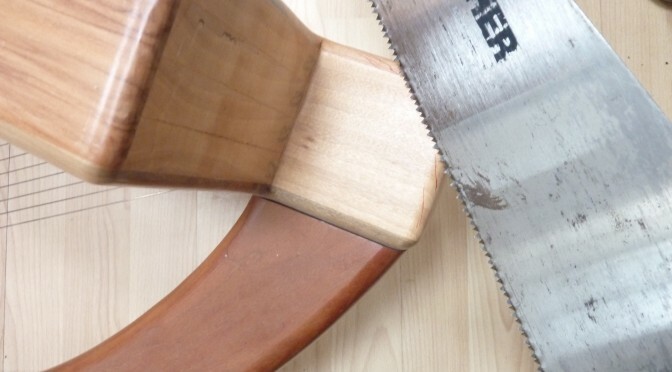 I shaped it with a spokeshave, sanded, and waxed it. It is not as well-finished now as David Kortier‘s original work, but it certainly does the job, and the harp now balances the same as the Queen Mary harp does. And it looks more elegant. If you have a Trinity College harp copy with the squared off foot, I would strongly recommend you to slice it down like this. Let me know how you get on. I really enjoy your blog. I am a student of Chad McAnally. Could you please tell me how much your lightened Patton harp weighs? I assume it is willow. Is it heavier than the HHSI equivalent? l use the bright markers l ordered last summer on my harp strings. They are so visible now. My replica of the Queen Mary harp weighs 4.88kg. I have no idea how much the HHSI Student Queen Mary harps typically weigh, I don’t have one handy here to check. Their neck and forepillar are much thicker, but they don’t have the metalwork on the neck.